Rifts® Vampire Kingdoms Now Shipping! 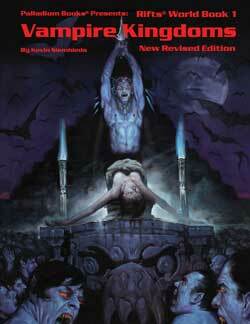 Rifts® Vampire Kingdoms arrived a week early, and is shipping now! Two Vampire Hunter O.C.C.s, all new. The new Hero Vampire and Deluded Vampire R.C.C.s as player characters. 224 pages – Cat. No. 802-E.
Buy Rifts® Vampire Kingdoms, New Revised Edition now!